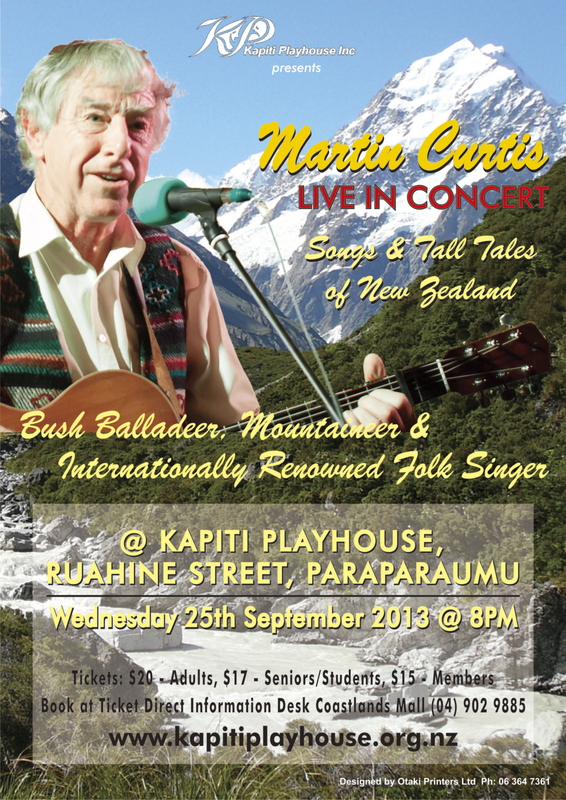 Martin Curtis - Live in Concert - Kapiti Playhouse Inc.
Bush Balladeer, Mountaineer, and Internationally Renowned Folk Singer Martin Curtis brings his live concert Songs & Tall Tales of New Zealand to Kapiti Playhouse on Wednesday 25th September at 8pm. Tickets are available from the Ticket Direct Information Desk in Coastlands – $20 Adults, $17 Seniors/Students, and $15 Kapiti Playhouse Members. 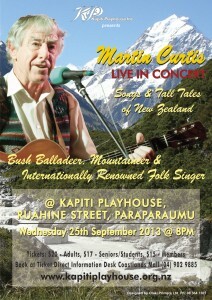 Martin has performed his songs and humorous bush poems in a wide variety of venues; from isolated islands in the Orkneys to busy cities like London, Bristol and Glasgow; and from tiny pubs in Wales and the Isle of Mull, to St David’s Hall in Cardiff, the national concert hall of Wales. On route he has given concerts in Perth, Darwin, Melbourne, Hong Kong and even Nepal. He has featured on BBC radio in Glasgow, Cardiff, Swansea, Shetland, and on Radio TV Hong Kong.